There is a difference between an employee leaving the business and being transferred to another store. 1. Go to People's Page and find your staff member by typing their name into the search bar in the top right. Then open their employee profile. 2. On the first page, if you scroll down you need to select the 'End Date' box and select the date which can be in the past or future. You then need to select what happens with their future shifts (even if you have set todays date or a date in the past.) These shifts can be deleted or moved to the gap row. 3. Once you have entered the end date and decided what to do with the future shifts, save and you will be prompted to confirm. 4. 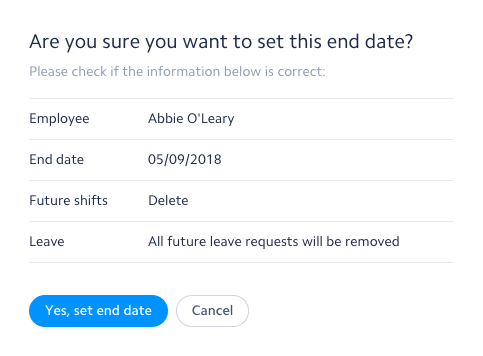 If chosen to delete shifts, all future shifts will be deleted. 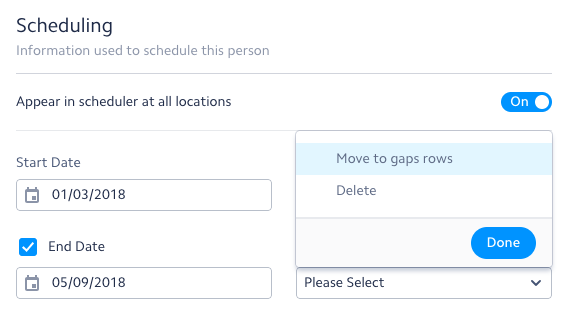 If you move to gaps row, they will be sent to the gap row for them to be assigned to another employee. For both choices, all leave requests in the future will be deleted. 5. Once you have saved your option, the employee will be deactivated from Rotageek from the date set or straight away if in the past. If the employee is transferring to another store, you will need to add a new location to his profile. Navigate to the employee's profile and add the location they're transferring to, along with the date of the transfer.